This is the story of the birth of two doelings, Cinnamon and Nutmeg. (pictured above). 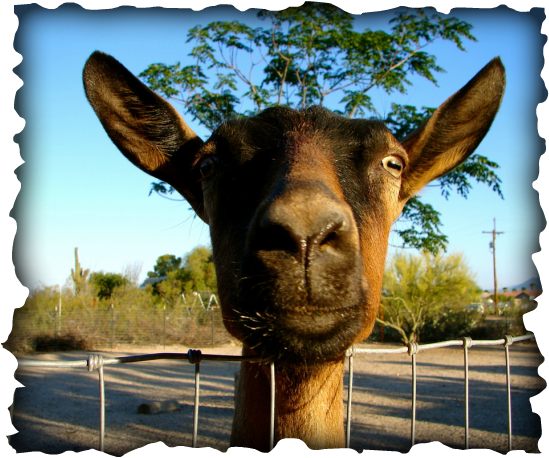 As you read you will learn quite a bit about goats, and visit one aspect of farm life. 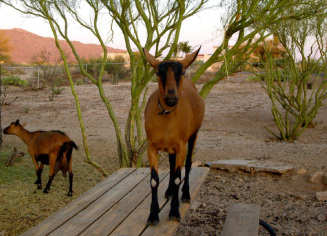 My family owns a small herd of Oberhasli dairy goats. They are a large breed and bred to produce large quantities of milk. The color pattern of this breed is almost always the same, brown with black markings. I said almost always, because sometimes Oberhaslis are born solid red or solid black. 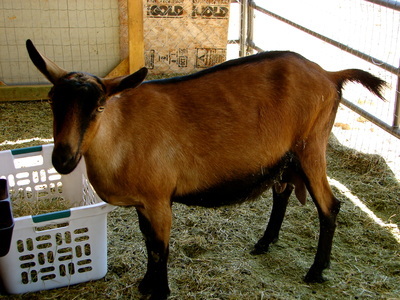 In order to keep our does in milk we freshen them every year by breeding them in the fall so they kid in the spring. As they become older we only need to freshen them every other year. Once they kid, they produce large amounts of milk, then slowly drop off in production as the year moves on. 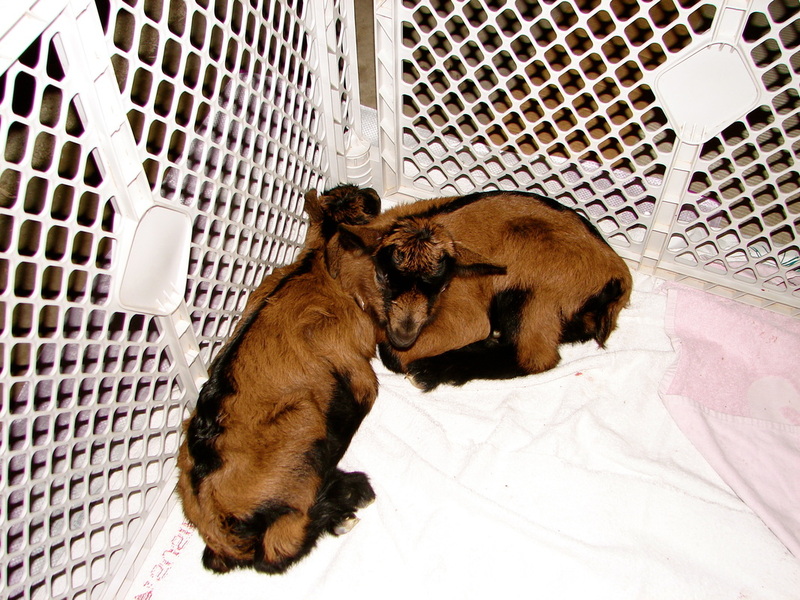 Today I am going to tell you about the birth of two doelings. (WARNING graphic photographs below). 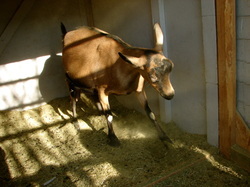 Goats have a gestation period of 5 months. It is actually quite difficult to know if they are pregnant. Up until about a week before a doe kids, she doesn't show at all. Unless, she is carrying triplets, which is very rare in large breeds. (center photo above). There are several signs that a doe is ready to kid. She will paw the ground, flag her tail, pace and grunt. On the right, you can see Glory pawing the ground. She is making a comfortable place to labor and kid. Our does normally labor lying down, then deliver standing. Glory has begun pushing. You can see the kid's sack, a bubble of fluid. Kids are born in a diving position, with their front hooves first. We did have one buckling born back hooves first, but his dam, Strawberry, was strong, healthy and young, so he didn't cause complications. A doe's labor and delivery is usually around 1-3 hours. They almost never have complications, and rarely require our help. It is a very exciting event. 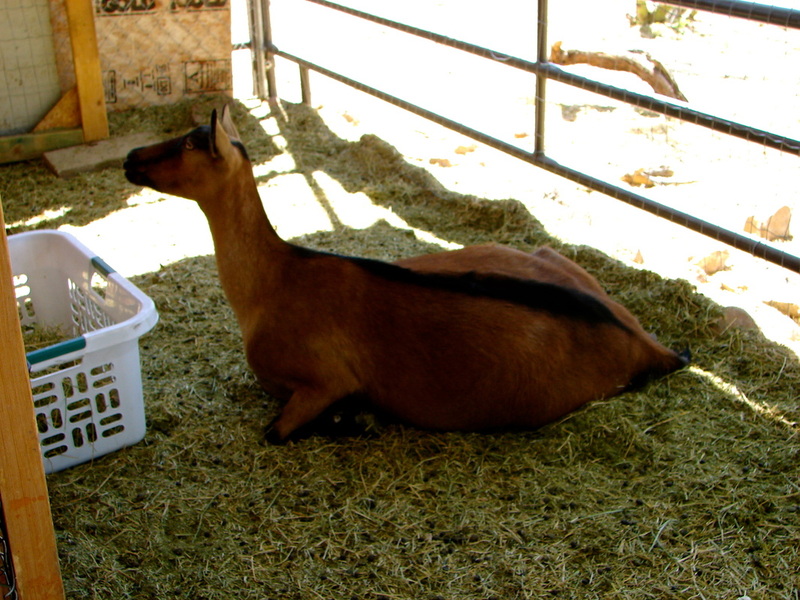 My siblings and I have often slept out side on the goat barn when a due date is nearing, so as not to miss the birth! Glory gave birth to two doelings. We named them Cinnamon and Nutmeg. In the photo to the right, you can see Cinnamon witnessing the birth of her sister. 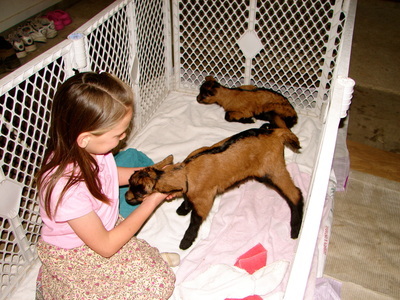 As soon as Cinnamon, (the first kid) was born, Glory began licking her off. Kids are born with all their fur, and teeth. Their eyes are open, and they try to stand within minutes of being born. They are the cutest little animals you've ever seen! Velvety fur, soft squishy hooves, floppy ears, and the sweetest sounding bay. 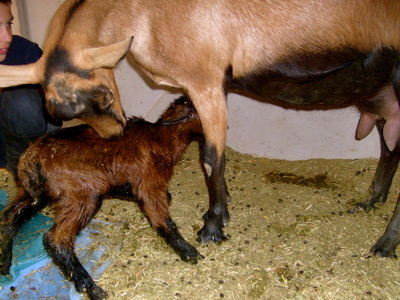 Here, Glory is licking off her second kid, Nutmeg. Once she has finished licking her kids, we dip their remaining piece of umbilical cord in iodine to sterilize it, then we tie a piece of dental floss tightly around it up close to the kid's belly. After a few days it dries up and falls off. Next, Glory delivered the afterbirth. She eats it, for two reasons; it provides her with essential nutrients and keeps the area clean for her kids. 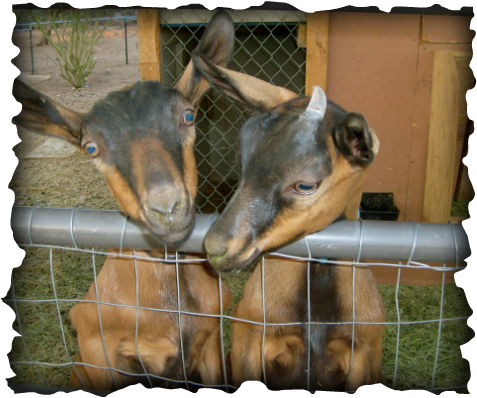 These are Glory's kids from the spring before. They are also watching this exciting event, and perhaps wondering what those two noisy, fuzzy things are doing here. In the photo directly above, you see cinnamon standing and trying to find a teat and nurse. 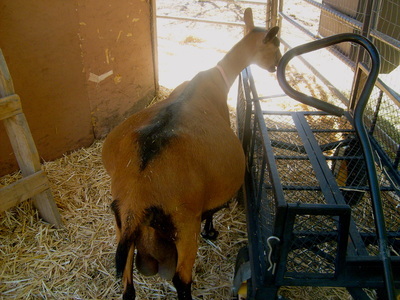 She noses fiercely and frantically down her mother's chest and stomach until she reaches a teat. 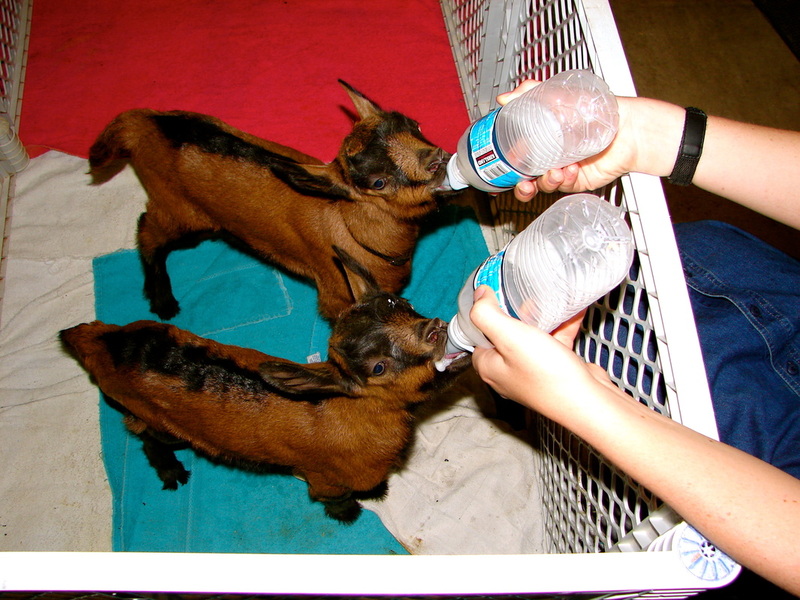 Because these goats are domesticated and not wild, we have to do things differently than is done in the wild. Oberhaslis have been bred to produce much more milk than the kids should drink. So we milk our does and bottle feed the kids, (photo on the right). We carefully measure the milk and record it before each feeding. 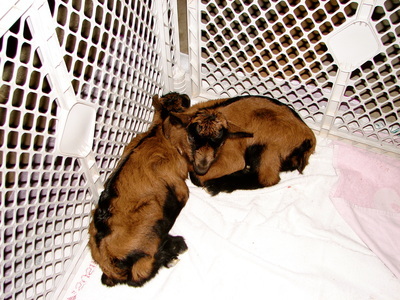 The first 2-3 days after a doe kids, she produces colostrum. Colostrum is very rich in nutrients and strengthens the new born kids' immune systems. It is thick and yellowish in color. Then, She produces pure white, sweet, creamy milk. What is left over after we've measured and filled the kids' bottles is for my family and I to drink. We all love it! After several months we slowly ween the kids off the milk and feed them alfalfa hay and give them water to drink. Then we get all the milk for our own consumption. My sister enjoying the new kids! They sleep in the garage for the first few nights because of the cold weather. I hope you enjoyed this birth story. Thank you for reading! Story and pictures by Lydia R.